Holly reached out to me early in her pregnancy for birth photography. We chatted on the phone for over and hour and I was beyond excited to photograph her birth. She was due in April, but in January wasn't feeling well and ended up going to the hospital. It was determined that Holly had preeclampsia and they needed to do an emergency c-section to get her baby out and save her life! 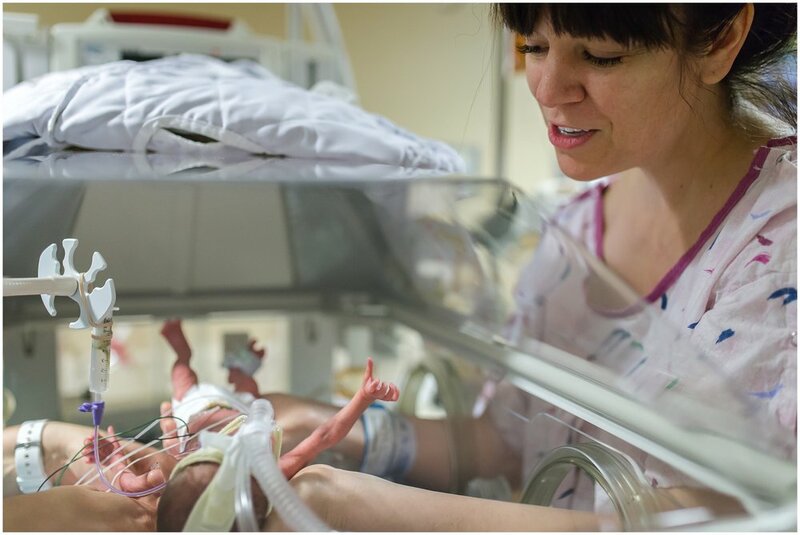 It was a scary and intense situation and I was able to come just a few days later to photograph Holly holding her son and some of their NICU journey. When I got to the hospital, I was nervous and excited to see Holly. It's very intense to go through such a traumatic delivery and birth and I wanted to see how she was holding up. She was smiling and pumping for Max, as I walked in the door. She told me her birth story, and I listened and cried. We hugged and talked more, she needed to process so much and I was grateful to be there and to listen. Eventually it was time to go see Max, and the nurse came and wheeled Holly down to the NICU where they would spend the winter with their son, Max. The photos are taken at Swedish Medical Center in Englewood, Colorado where Holly's son spent nearly three months. Max did such an amazing job growing and thriving that he went home several weeks before his due date! He's nearly one now and thriving! I'm so blessed to be a part of their story and grateful our paths crossed. Please take a minute to check out Warrior Max's photos and NICU journey. Holly sat and held her tiny baby Max for as long as she could. She was still recovering. What a precious moment.